The University of New England FutureCampus in Parramatta is bringing its students and lecturers closer than ever before in an Australian-first partnership with Microsoft Corporation. UNE FutureCampus in Parramatta played host to Australia’s first ever Technology Enriched Instruction workshop, exploring the changing learning expectations of students and how technology is meeting those demands. “UNE was the first tertiary provider in Australia to offer off-campus education and today, with almost 80% of our students studying online, UNE is one of the largest and fastest growing online providers of University education in Australia,” Professor Duncan said. Education Director for Microsoft Australia, George Stavrakakis said the Technology Enriched Instruction workshop allowed UNE’s educators to actively experience a range of teaching and learning technology tools. “Today’s workforce operates in a mobile workplace and to prepare students to succeed, we need to encourage and enable them to become mobile learners and active participants beyond the walls of the classroom,” Mr Stavrakakis said. 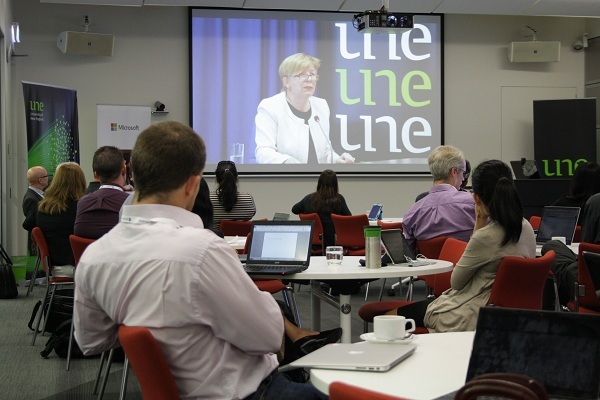 Professor Duncan said the partnership with Microsoft would provide greater opportunities for UNE researchers and lecturers to collaborate at the leading edge of digital education technology, connecting directly with students, anywhere, anytime. 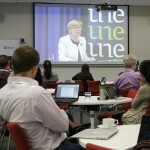 “Through this partnership, our staff and students will benefit from the opportunity provided through software-based audio & video conferencing via Microsoft Lync, which enables the University to deliver a superior set of educational tools directly into the hands of its users through the device of their choice, no matter where they are,” Professor Duncan said.